Menkes disease is an X-linked neurodegenerative disease of impaired copper transport to different tissues caused by mutation of the P-type ATPase 7 gene. Copper deficiency causes mitochondrial damage in the brain through inactivation of cytochrome c oxidase and leads to apoptotic death via the mitochondrial pathway. Here, we report a 6-month-old-boy, who was admitted with hypotonia. He had distinctive pale skin and light brown tangled hair, more concentrated frontocentrally but very sparse in the temporal areas. Laboratory analysis of blood revealed lactate level of 4.6 mmol/L (N: 0.5-2.2 mmol/L), copper level of 0.1 μg/ ml (N: 0.9-1.1 μg/ml), and ceruloplasmin level of 4.98 mg/dL (N: 20-60 mg/dL). Microscopic examination of hair revealed a pili torti appearance. Based on these clinical and laboratory findings, the patient was diagnosed with Menkes disease. At the follow-up examination, the patient had brief tonic eye deviation and clonic movements of the left side of the body. Electroencephalography showed sharp and slow wave complexes in the right hemisphere. Cranial magnetic resonance imaging (MRI) was performed using a 1.5 Tesla scanner (Symphony, Siemens, Germany) and T2-weighted images showed a high-intensity lesion in the right temporal lobe as well as gyral enlargement and a narrowing of the Sylvian fissure [Figure 1]. Diffusion-weighted MRI demonstrated low intensity and an increased apparent diffusion coefficient, indicative of vasogenic edema [Figure 2]. H1 MRS showed lactate peaks in the temporal lobe and bilateral basal ganglia. MRI conducted again at the age of 9 months showed only cerebral atrophy. 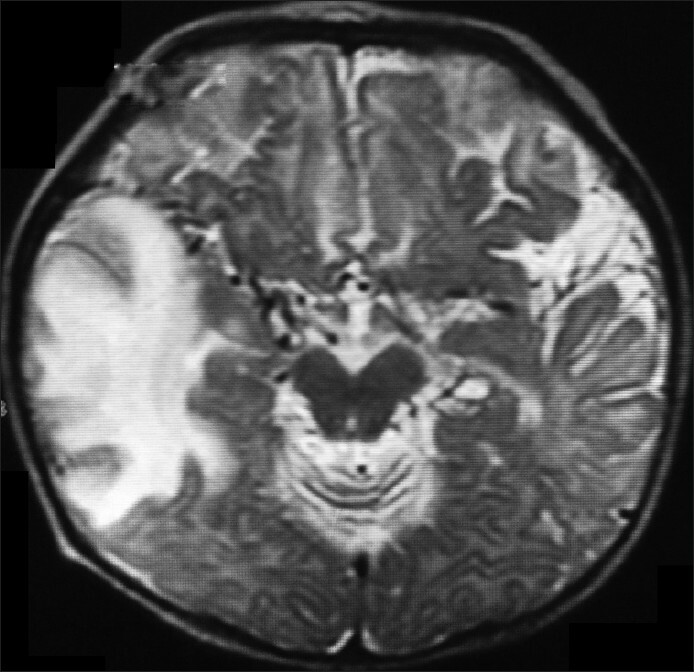 Temporal lobe edema in Menkes disease has only been previously reported in four cases. The first case was a 5-month-old boy presenting with bilateral temporal lobe hyperintensities on T2-weighted images. Repeated MRIs showed the disappearance of lesions at 6 months of age, and the diffuse atrophy of cerebrum, cerebellum and brainstem at 12 months of age. The second case was a 7-month-old boy with a transient left temporal lobe lesion and low cytochrome c oxidase activity in platelets. The third case was a 5-month-old boy with hyperintensities in the putamen, head of caudate nuclei, and bilateral temporal lobes. 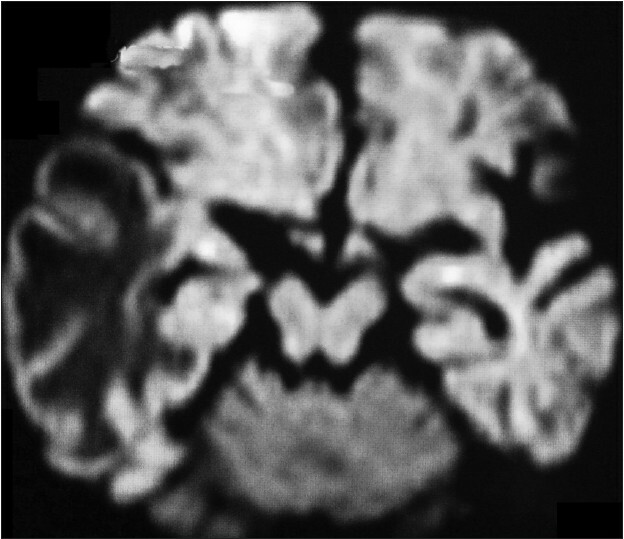 Diffusion-weighted MRI revealed cytotoxic edema of the putamen and caudate nuclei and vasogenic edema of the temporal lobes. The most recent case was a 7-month-old boy with left temporal edema of vasogenic nature, which disappeared by the time a second image was taken at 8 months of age. In all four cases as well as ours, the patients had seizures before cranial imaging was done. The age group of all four patients and localization of the lesion was similar to our case, and in the latter three cases MRS revealed lactate peaks in the basal ganglia and temporal lobes, as in our case. We concluded that transient temporal lesions are early findings in the progressive course of Menkes disease and energy metabolism failure induced by seizures seems to be responsible for vasogenic edema. 1. Rossi L, Lombardo MF, Ciriolo MR, Rotilio G. Mitochondrial dysfunction in neurodegenerative diseases associated with copper imbalance. Neurochem Res 2004;29:493-504. 2. Takanashi S, Ishii K, Matsumoto K, Higano S, Ishibashi T, Zuguchi M, et al. Cranial MRI and MR angiography in Menkes' syndrome. Neuroradiology 1993;35:556-8. 3. de Bie P, Muller P, Wijmenga C, Klomp LW. Molecular pathogenesis of Wilson and Menkes disease: Correlation of mutations with molecular defects and disease phenotypes. J Med Genet 2007;44:673-88. 4. Ozawa H, Kodama H, Murata Y, Takashima S, Noma S. Transient temporal lobe changes and a novel mutation in a patient with Menkes disease. Pediatr Int 2001;4:437-40. 5. Ito H, Mori K, Sakata M, Naito E, Harada M, Minato M, et al. Pathophysiology of the transient temporal lobe lesion in a patient with Menkes disease. Pediatr Int 2008;6:825-7. 6. Barnerias C, Boddaert N, Guiraud P, Desguerre I, Hertz Pannier L, Dulac O, et al. Unusual magnetic resonance imaging features in Menkes disease. Brain Dev 2008;7:489-92. 7. Ito H, Mori K, Sakata M, Naito E, Harada M, Kagami S. Transient left temporal lobe lesion in Menkes disease may influence the generation of tonic spasms. Brain Dev 2011;33:345-8. 8. Yoneda M, Maeda M, Kimura H, Fujii A, Katayama K, Kuriyama M. Vasogenic edema on MELAS: A serial study with diffusion-weighted MR imaging. Neurology 1999;53:2182-4.